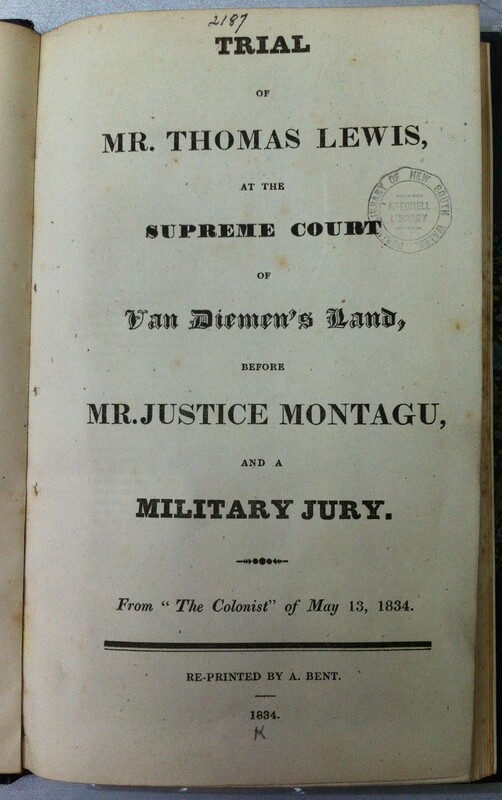 Trial of Mr. Thomas Lewis, at the Supreme Court of Van Diemen’s Land, before Mr. Justice Montagu, and a Military Jury. From “The Colonist” of May 13, 1834. Re-printed by A. Bent. 1834. 56, x p., 20.6 x 12.5 cm. Blue paper wrappers. Ferguson 1812. Copies: ANL; BL; KCL; ML (2 copies); NSL; TAHO (2 copies GO33/1/19 and CSO1/1/727/15793); TNA CO280/52 (incomplete), CO280/55 (complete copy sent per Mary which left Hobart 8 Feb. 1835) CO280/73, CO280/92 f. 630-662 (sent in by William Bryan on 3 Dec 1836); TSL; 1 copy (ex Rollo Hammet Collection) in private hands. Also includes correspondence from after the trial. Lewis was tried for inciting a breach of the peace by carrying a challenge on behalf of William Bryan. The trial (on account of both Justice Montagu’s overbearing conduct in court and the severe sentence) became a rallying point for Arthur’s opponents as the clamour around the complex Bryan affair built up. At least one incomplete copy (stopping mid sentence on p. 32) was sent to the Colonial Office before the end of 1834. The pamphlet was finished by early 1835 and a complete copy sent to Colonial Office (via Arthur) per Mary (departed 8 Feb. 1834). Somewhat confusingly Bent announced it as ‘just published’ in BN 9 Jan 1836. Only a few copies then remained on hand at 10s. each. By this time Lewis had been released from gaol, and was engaged in lengthy negotiations for compensation. A note by Bent dated 3 July 1838 stated he had received £47.6.0 from Mr. Lewis ‘for Printing one part of His Pamphlet’ (Tas. Parl. Archives LC7/1). Justice Montagu later asserted that the account of the trial in the pamphlet was grossly untrue and garbled (encl. in Arthur to Glenelg 30 May 1836 CO280/73 f. 299-317). Nonetheless the law officers in England concluded that Lewis had been improperly convicted, the sentence was one of extraordinary severity and Arthur was remiss in not acceding to Lewis’ request for an inquiry into the case and Montagu’s conduct in it. Murray, Henry Nairne. The Schoolmaster in Van Diemen’s Land. A practical Treatise on Education, for the use of Parents and Others, not professed Teachers. By Henry Nairne Murray. Hobart Town: Printed by Andrew Bent, at the Colonist Office. 1834.
viii, 86 p., 17.6 x 10 cm. (varies slightly). Title printed also on cover which has decorative border. Colophon: Printed by A. Bent, at the Imperial Press. Jorgenson, Jorgen. 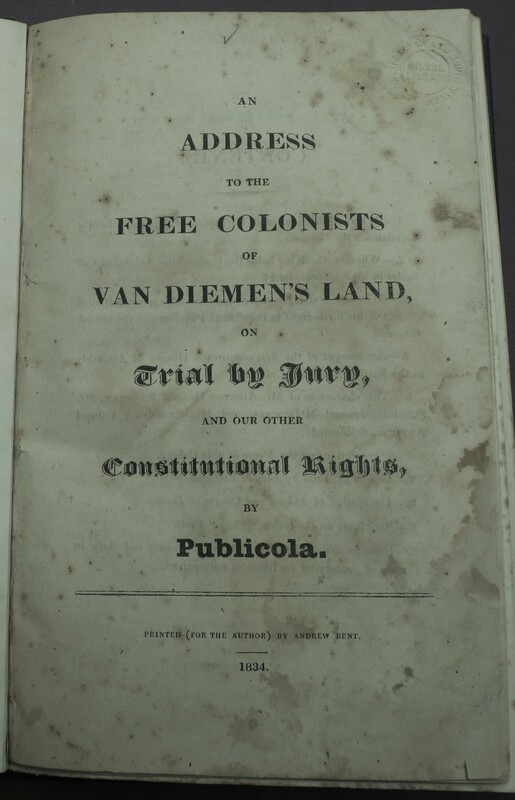 An Address to the Free Colonists of Van Diemen’s Land, on Trial by Jury, and our other Constitutional Rights. By Publicola. Printed (for the Author) by Andrew Bent. 1834. 30,  p., 21.2 x 12.5 cm. 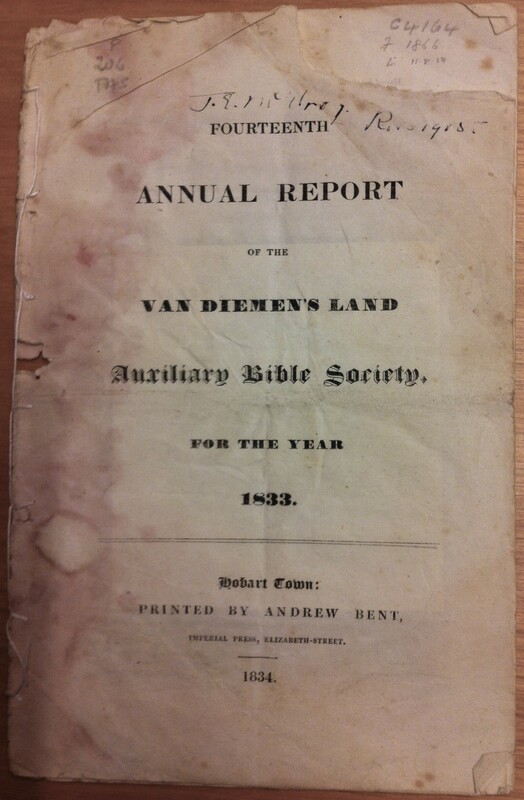 Fourteenth annual Report of the Van Diemen’s Land Auxiliary Bible Society, for the Year 1833. Hobart Town: Printed by Andrew Bent, Imperial Press, Elizabeth-Street. 1834. 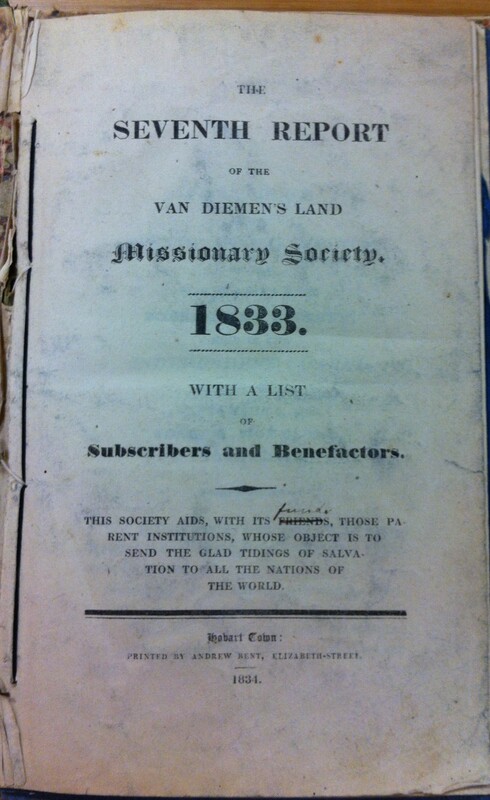 The seventh Report of the Van Diemen’s Land Missionary Society, 1833. With a List of Subscribers and Benefactors. Hobart Town: Printed by Andrew Bent, Elizabeth-street. 1834. Not in Ferguson. No known copies. Ferguson 1812a. No copies. Advertised as just published in the Colonist, 8 July 1834.